Explore the pages of this awesome site often to keep up with the authors on tour. Please leave your comments, questions, and observation at each post. The authors really want to hear from you and so do I. 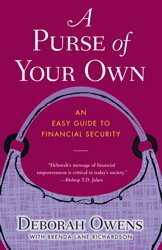 Join the Power of the Purse Community receive a free download of Chapter 10 of A Purse of Your Own, and get instructions on how you can start your own Purse Group. Register at www.deborahowens.com You will receive updates on the Power of the Purse Campaign and announcements for additional promotional offerings and events. There are certainly a lot of particulars like that to take into consideration. That may be a great point to bring up. I offer the ideas above as normal inspiration however clearly there are questions just like the one you deliver up the place crucial thing shall be working in sincere good faith. I don?t know if best practices have emerged around issues like that, however I am sure that your job is clearly identified as a fair game. Both boys and girls really feel the impression of just a second’s pleasure, for the rest of their lives. My partner and I absolutely love your blog and find almost all of your post’s to be exactly I’m looking for. Would you offer guest writers to write content for you? I wouldn’t mind composing a post or elaborating on most of the subjects you write with regards to here. Again, awesome web site! Thank you so much for visiting our website. We really appreciate your comments. We are so inspired by them. I am in the process of trying to find you on facebook. Woah! I’m really enjoying the template/theme of this website. It’s simple, yet effective. A lot of times it’s very difficult to get that “perfect balance” between superb usability and appearance. I must say that you’ve done a very good job with this. Also, the blog loads super fast for me on Firefox. Excellent Blog! Good Morning, having recently redone my website, yours is one that I really admire. The subtle elegance of it really comes across. I’m also interested in the procedure for submitting the book Taboo Tree for review consideration. Please contact me via facebook or email (preferred). Thank You. Im inquiring how I can submit my novel Tribes of Time to your group. It revolves around Dr. Haines Johnson, a Physicist traveling through rural Tennessee on his way to a conference when he is inextricably drawn into a heinous lynching in progress. His actions saves the intended victim, but thrust him into a battle for his life against a corrupt Sheriff and Legal System. With the help of his college fraternity brother and prominent Washington DC attorney Roderick Sprewell, they expose a system of peonage (leased penal slavery) and murder in fictitious Cumberland County. I’d be more than willing to send you a few copies to review. “Sankofa Literary Society-Literary Review” was a relatively awesome blog post, . IE nonetheless is the market chief and a large part of people will miss your excellent writing due to this problem. How does an author get their work in a review or viewed by your staff?